We literally kick it off with made up OCD podcasting. A bit of a review on Creed (the movie) before we go full swing into the Batman V Superman trailer. Did we like it?.. find out! There's literally a lot of talk about movies this week. Hollywood, take note. We have ideas! Once again, literally talking to us from Australia, is friend and composer Michael Howes! 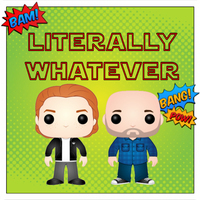 We cover all sorts of topics such as the recent UFC fight, a lucky cactus, Nanobots and HDR machines, Fallout 4, Netflix series' and whatever else! Enter the Bashing Ground! We literally launch right into some more techno hauntings before chatting about The Flash and DC supervillains! There's some followbait frusteration, rap battle prep and whatever else. It's literally a wide range of topics this week including a comedy show outing, a missed commercial opportunity, discussion of the new James Bond film Spectre, Leo in Victoria, video game movies and whatever else! Episode LVII - Did Somebody Say "Fantastic"? Literally this week is an accidental full disection of the critically despised film Fantastic Four AKA - Fant4stic. If you like hearing us pick apart bad movies, you're in for a ride! Guess what... it's literally a Star Wars extravoganza! We talk about the new trailer with some speculation, advanced tickets, and some re-imagining of the prequel trilogy! Also, some followup on the recent election or whatever. May this podcast be with you... always. Star Wars, Canadian election, a high speed chase, wacky hands, vegans and Vikings! Literally! This week, we literally advise against putting poultry into a computer. We touch briefly on Canadian Thanksgiving, The Martian, New Mexico, a potential feud with a former guest and whatever. else The Main course is some details about Star Wars Battlefront... If it's not enough listening to the whole episode, just wait until the end!